What do we have here? It’s a complete village builder set! All assets are hand-drawn, they have an organic feel and there are many variations to each one, so no part looks the same. This village builder-set produces small villages in a warm autumn-esque style. The pieces are varied enough to create plenty of different environments. You can see any of the 6 remade villages below for examples. All assets are labeled with the dimensions in squares to look properly in the Roll20 tabletop (i.e 4×4) This pack contains over 95 different assets to build an awesome village. I have included 6 prebuilt villages ready to drop for an instant bang-for-your-buck. Are you a module creator or writer? 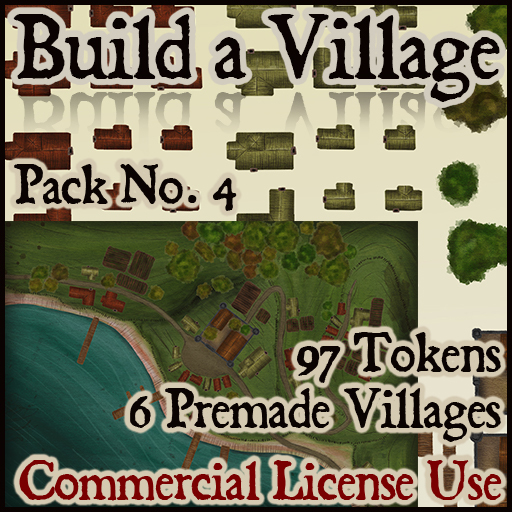 This village pack is available for commercial use at no extra charge. You can use locations created with these assets in your modules and adventures. To obtain this commercial license, please contact me.